"Indian saffron is richer, darker in its red-orange color then the Spanish or Italian, and gives a better flavor to rice. The saffron should always be steeped in hot water ahead of time and used as part of the liquid in the recipe. The following is a recipe prepared in the Indian manner." 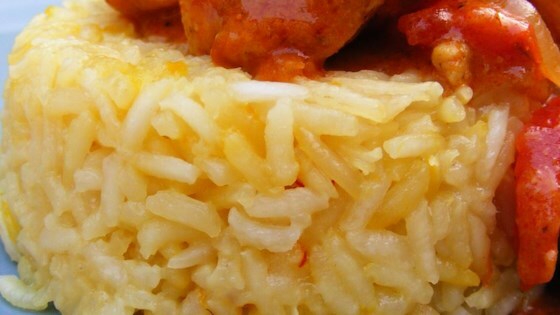 Spice up your rice side dish with a smidge of saffron. Excellent recipe. I topped each serving with a light sprinkle of cinnamon and toasted pine nuts as they do in a local restaurant. Scrumptious! Great recipe!! However, I used chicken broth instead of the water, and it turned out excellent. The saffron rice went great with the Marakesh Vegetable Curry.